The Global Food Safety Initiative (GFSI), headquartered in Paris, France, brings together key sectors of the food industry every year to drive continuous improvement in food safety management systems around the world. 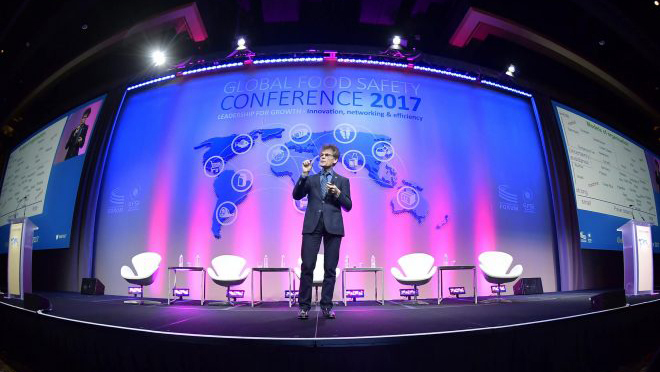 In 2017, GFSI held its 16th annual Global Food Safety Conference in Houston, marking the first time the conference would ever be held in the state of Texas. GFSI anticipated a record 1,200 attendees from 60 countries, with delegates representing all sectors of the food industry, including farming, fishing, trucking, production and distribution. CEOs from several of the world’s major food companies were set to arrive, too, and give speeches about their efforts to drive change in food safety at their respective companies. Additionally, over 100 representatives from more than 20 countries were expected to converge before the conference for a “G30” summit on food safety and international collaboration. Murnahan PR received the assignment only 25 days before the conference but immediately took the helm at planning, creating, executing and documenting wide-reaching communications for this record-breaking international event. Murnahan PR researched industry, trade and business media outlets across the globe and developed a target list of 2,200 media outlets from 90 different countries. We worked especially hard at securing coverage from local and state outlets. The goal was to provide full support for the on-site media representatives and the global media network covering the conference from afar. Here are some of the other the tactics Murnahan PR employed to drive awareness of the event. We orchestrated a media tour of the nationally recognized Karbach Brewing Company in Houston, which follows GFSI’s food safety guidelines. The event included a hard-hat tour of the brewing operations, brew samples and dinner at the brew house’s on-site restaurant. We arranged a news event to launch the conference with announcements from seven food giant CEOs about their companies’ ground-breaking strides in public-private collaboration. GFSI also used this media event to announce the publication of its highly anticipated Benchmarking Requirements V7, the world’s most widely accepted benchmarking criteria. This news conference also announced results from the “G30” meeting. We organized a second news conference to announce the unprecedented public-private partnership between GFSI and the Mexican National Service of Health and Agro-Food Quality to collaborate on the common goal of providing continuous improvement in food safety management systems. We wrote and distributed two media advisories, a media tour advisory and five news releases, two of which were translated into Spanish. We produced two videos: Myanmar’s First Fisherwoman Shares Her GFSI Story and GFSI Helped Us Achieve a Big Dream. The Myanmar video earned more than 18,000 views on YouTube, while the Big Dream video had almost 19,000. Thousands of additional views were tallied on conference video platforms. A special event website specific for media and conference attendees. Another key achievement by the Murnahan PR team was the conceptualization and launch of a powerful new website: BoilerPlateNews.com/GFSI. Updated every few hours throughout the conference, the site provided background and profiles on speakers, news releases, summaries of conference sessions, news stories relating to global food safety, media contacts, and links to social media platforms. The website also featured a vast gallery of photos. A number of leading trade outlets provided broad coverage of the Global Food Safety Conference, including Meat+Poultry, Food Business News, The Packer, European Supermarket Magazine, Quality Assurance & Food Safety Magazine, Food Safety Tech Magazine, FoodQualityNews.com, Process Alimentaire, United Nations Industrial Development Organization (UNIDO) News, BF Business Facilities, FE Fleet Equipment, Textile World, Refrigerated & Frozen Foods and Produce Grower. This media outreach was estimated to result in more than 600 media stories reaching hundreds of millions of food safety industry representatives around the globe. The coverage also afforded GFSI the opportunity to establish relationships with important new trade publications.